A mountainous island and one of the birding highlights of the southern Moluccas. The main birding site at present is the Wamlana Logging Road, which allows access to part logged hill and lower montane forest in the centre of the island. This provides opportunity to access nearly all of the endemic species present on the island. The bizarre Madanga Pipit (a tree hugging montane pipit otherwise known as Rufous-throated White-eye), is the only endemic that has not been recently recorded from the forests along this road. A second location, Bara – on the north west coast – is possibly an even better site with areas of extensive forest from coast to the high tops, but access here to high ground is difficult (would require a full expedition!). Forsten’s (Dusky) Scrubfowl, Moluccan Scrubfowl, Amboyna (Slender-billed) Cuckoo-dove, Great Cuckoo-dove, Buru Green Pigeon, Superb Fruit Dove, White-bibbed (Moluccan) Fruit Dove, Claret-breasted Fruit Dove, Moluccan (Spectacled) Imperial Pigeon, Buru Mountain Pigeon, Moluccan Brush Cuckoo, Pygmy Eagle, Varied Goshawk, Lesser (Moluccan/Australian) Masked Owl, Buru (Hantu) Boobook, Moluccan Scops Owl, Common Paradise Kingfisher, Variable (Buru) Dwarf Kingfisher, Spotted Kestrel, Red-breasted Pygmy Parrot, Red Lory, Coconut (Rainbow) Lorikeet, Eclectus Parrot, Red-cheeked Parrot, Buru Racket-tail, Black-lored Parrot, Buru (Blue-fronted) Lorikeet, Great-billed Parrot, Moluccan King Parrot, Sahul (Red-bellied/Buru/South Moluccas) Pitta, Elegant Pitta (elegans), Seram Swiftlet, Glossy Swiftlet (Eastern), Buru Honeyeater, Buru (Wakolo) Myzomela, Buru (Northern) Fantail, Tawny-backed Fantail, Buru Friarbird, Buru Oriole, Drab Whistler, Moluccan (Golden) Whistler, Buru Cuckooshrike, Pale Cicadabird, Buru Spangled Drongo, Island Monarch, Buru (Black-tipped) Monarch, Buru Golden Bulbul, Madanga Pipit (Rufous-fronted White-eye), Buru White-eye, Buru (Island) Leaf Warbler, Buru Grasshopper Warbler (Chestnut-backed Bush Warbler), Moluccan Starling, Buru Thrush, Buru Warbling-Flycatcher (Streaky-breasted Jungle Flycatcher), Cinnamon-chested Flycatcher, Buru Flowerpecker, Olive-backed (Black-bellied) Sunbird. The Wamlana Logging Road is a c50km section of road that leads to Danu Rana, a lake in the mountains of Buru. Despite the logging there are still patches of forest on the steepest slopes along with developing secondary growth. The main section of road is however quite open and the forest difficult to get into. Just about everything of interest has been seen along this road over the years, being the most birded site on the island. The highest point on the road is at c33-34km with another high point about 13-16km along. The high points are just in range for the montane Buru Honeyeater, Black-lored Parrot and Buru (Blue-fronted) Lorikeet, although the latter two are very rare. It is possible that the Madanga Pipit is also present somewhere within striking distance of the highest point of this road. Aside from the tough species mentioned above, other sections of the road provide the opportunity to see all of Buru’s other endemics. 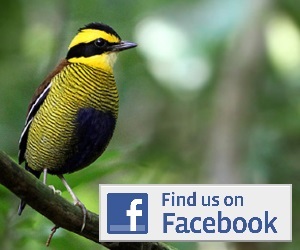 The sought after Buru Thrush inhabits forest gulleys, often side by side with the Buru form of Sahul Pitta. If the bird has ‘Buru’ in its name, chances are you can see it along this logging road – Buru Mountain Pigeon, Buru White-eye, Buru Cuckooshrike, the Buru form of Variable Dwarf Kingfisher, Buru Friarbird, Buru Oriole, Buru Warbling-Flycatcher, Buru Grasshopper Warbler, Buru Golden Bulbul, Buru Spangled Drongo, Buru & Tawny-backed Fantails, Buru Leaf Warbler, Buru Flowerpecker, Buru Myzomela and Buru Racket-tail can all be found along the road. Lower sections are good for Buru Monarch. And its not just birds with Buru in their name, many of the key species mentioned above can be seen somewhere along this logging road. Keep a look out skyward for flyby Red Lory’s, Mollucan King Parrots, or the small Eagle that is presumably a form or morph of Pygmy Eagle, with a plumage seemingly identical to Booted Eagle. At night, once you have got past the lower sections, listen for the soft call of Buru Boobook, which is present in forest along the road. Also present is Moluccan Scops Owl and if you are lucky the crepuscular activities of Black-lored Parrot may lead you to a rare sighting. The village of Bara on the north west coast of Buru was a tricky place to get to a few years ago. Now there is a paved road with brand new bridges spanning the various rivers flowing down to the north coast, and as a result the village is easily accessible. The stretch of road to the harbour at Bara has small amounts of accessible lowland forest, and this area is a reliable location for a couple of species that are very hard on the lower sections of the Wamlana Logging Road, namely Buru Green Pigeon and Australian Masked Owl. The forest along the stretch of cliffs rising south of the road by Bara and forest west of the large bridge over the river before the harbour are good places to try. As well as the two rarities, other species are present, including a number of pigeons and parrots, Buru Monarch, Elegant Pitta, Moustached Treeswift, and in the more open cultivated and scrubby areas, Forsten’s Scrubfowl. If you are feeling adventurous then you can probably still walk through continuous forest from the coast to the high peaks off to the south. This would of course necessitate a full on expedition, but the forests here are more intact than in the centre of the island, and all the species are likely to be there somewhere. There is a small amount of lowland forest at Waspait, south of the village. Here Buru and Island Monarch are present in the dwindling areas of forest, along with parrots, including Moluccan King Parrot, and pigeons – even rarely Buru Green Pigeon – but these are much scarcer these days. North and west of the village, along the coast are traditional areas where Moluccan Scrubfowl come down at night to bury their eggs in the sand. The locals know where these areas are, which is why the bird is unfortunately now likely to be rare, but if you ask around you may be able to get someone to show you the favoured areas. Getting to Buru at present involves an overnight Ferry from Galala port in Kota Ambon. The ferry has a number of options from ‘VIP cabins’ to basic shared bunks. The more luxurious options tend to sell out quick, so it is best to get your ticket as early as possible. When there are no delays the ferry arrives in the port of Namlea very early in the morning, whereby you can organise a shared taxi/minibus along the northern coast road to the villages of Waspait, Airbuaya or Bara. Chartering a taxi should also be possible. In Waspait, one of the closest villages to the Wamlana Logging Road there is a recently built resort the ‘Buru Island Resort’ which is actually pretty upmarket for the south Moluccas! From here you should be able to arrange transport to take you into the mountains on the Wamlana Logging Road. Another option is to ask at the shops at the start of the Logging Road, or in the village of Waspait or Wamlana, although you may struggle to find someone who speaks reasonable English. The logging road itself has a very steep initial climb, and as such a 4×4 vehicle is required. There are also likely to be a small number shared 4x4s that run along the road to settlements around Danu Rana, so you may be able to hitch or pay for a lift into the hills this way, but make sure you are prepared for a long wait and have the means and supplies to walk out or camp if there is no return option! Having your own vehicle and driver has to be the best way to bird along this road. Getting to Bara is possible in private taxi or maybe a shared minibus/pick up. If you have your own vehicle it is now possible to get from Waspait to Bara in about an hour, negating the need to stay in Bara or Airbaya. Both these latter two villages have accommodation options, although the homestay in Bara is the village head’s house. If you wish to stay in Bara, it is best to arrive in the village and seek out the village head, to enquire about current accommodation options. You should also be able to get a basic meal at the homestay, as there is no public cafes in Bara. 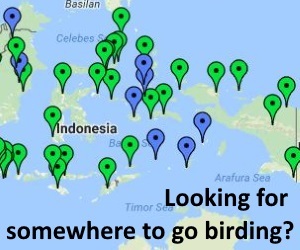 In (and ex) country ground agents/guides have been used by birders in this part of the Moluccas before, including agents based in Ambon, and there are trip reports out there with such details if you prefer to have someone arrange the logistics for you (at a price of course).